A few updates on earlier posts. You may remember those great videos by that majestic Malian diva Kandia Kouyaté (here, here and here). When I met her in Bamako last year Lucy Duran pointed out to me that it was unlikely, if not completely incorrect, that Kandia was 18 when these videos were recorded. I told her I was inclined to agree with her but was hesitant to correct this, as the 'grand dame' herself was the source of this information. 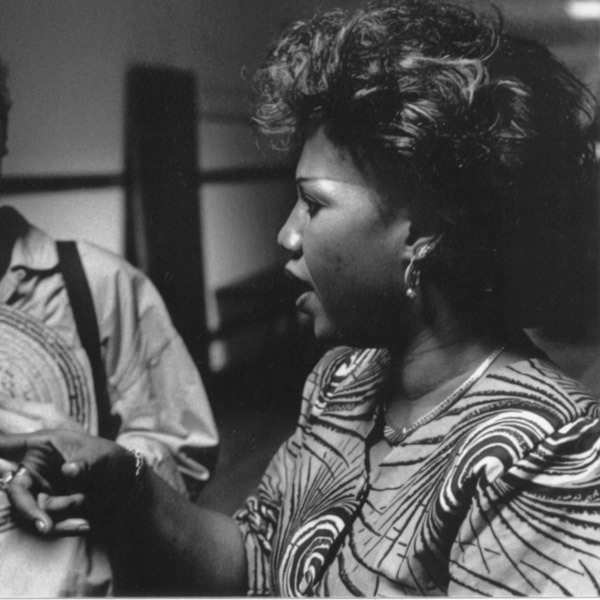 She had told me this when I interviewed her in 1990 (photo - by the great Ton Verhees - on the right). Lucy has since reminded me in an email. She wrote: "Mali TV opened in 1983 and Kandia was born in 1958. I first met her in 1986 which is around the time that she did songs like Moussolou. Bouba Sacko only joined her group in 1985, before that she had a 12 string guitarist from Kita called Kissima Diabate who was living in Abidjan, and with whom she recorded Amary Daou présente Kandia Kouyate. So Actually Kandia will have been around 27 or 28 when she filmed those clips. The presenter was Zoumana Yoro Traoré and the programme was probably 'Artiste et sa musique'." Then some updates from Guinea. Graeme Counsel (website!!) is in Conakry at the moment continuing his work digitising and preserving the archives of the RTG. 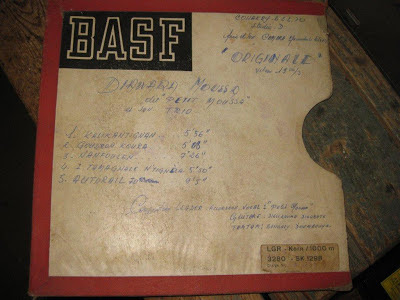 He has tumbled upon the original reel containing the first track of side B of that superb album "Boum à Conakry". According to the notes and label of the album this is a track called "El Checheré" by the Orchestre de la Paillote. It turns out that this information is incorrect. In fact the song is by l'Orchestre Honoré Coppet, and was recorded either on February 2 or March 24, 1963 at the Bonne Auberge by a certain Katty using a Nagra III reel-to-reel recorder! And this "Katty", Graeme adds, is probably Emmanuel Kathy, a director of the Voix de la Révolution studios. Honoré Coppet was born in Martinique and traveled to Senegal and Guinea in the late 1950s. 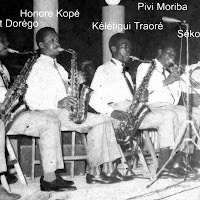 He played alto saxophone in the Syli Orchestre Nationale. 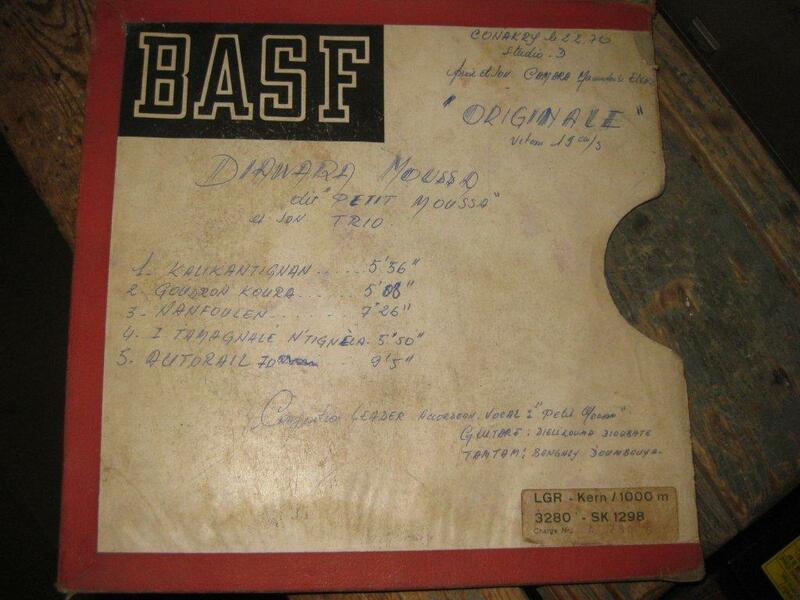 And yesterday he reported that he has found a reel containing recordings by that amazing accordeon player Petit Moussa (you may remember the mind boggling cassette sleeve). Apparently the man is called Moussa Diawara. Graeme has added a photo of this amazing find. Let's hope (or if you like you may pray) that these recordings are as spectacular as the ones on the cassette! That's all for now. More music to follow soon. Exciting stuff. You know of the Radio Tanzania project as well no doubt. I am looking forward to the treasures unearthed from both these projects, and there are some fascinating signs of what is to come here!! David says:You know of the Radio Tanzania`s project as well? Well,I for one do not know. Do you mean,RTD have finnaly woken up,and start digitising all the brilliant work done by its illustriace sons,like Mbaraka Mwinshehe,for one,and then make all his work available to be bought by members of the public? That will be be excellent news,as it was here that Soloist National recorded all his songs first,so all his songs at RTD are the originals/and later on,much later on,after months say,did he use to travel to Nairobi,Kenya,to record the songs again with the commercial recording companies,for a little bit financial gain. But as someone who knows his stuff on him,I tell you without any doubt,that if you really want to immerse/enjoy and really come to appreciate his music,then get your hands on his songs from RTD,and then you will see the difference with the Ukumbusho versions. You will see that same songs,but with different guitar play from him,and without exception,the RTD versions being far superior. Now,kindly tell me about this RTD project,in its details,please,David. Regards,to you David,and also Stephen,without whom all this would not be possible. This post prompted me to listen the Petit Moussa cassette that you posted earlier. Wow! It's pretty incredible. The lo-fi warble only adds the mysterious and unique ambience. Thanks a lot@zim for your kindness ,but I have tried that link,and nothing comes up. Any any other idea,how I can learn more on the Project? @ Ina Fatoumata Kébé: Je ne comprends pas, tu parles de quel album?